Click on picture to view full collage. Last week the girls and I took part in two great activities arranged by the Moreton Bay Regional Council as part of the Professional Parents Family Fun Outings. Monday was Kumbatcho (will write a post soon) and Friday was Osprey House. “The girls” are my daughters Sophia (three and a half) and Isabella (one and a half). 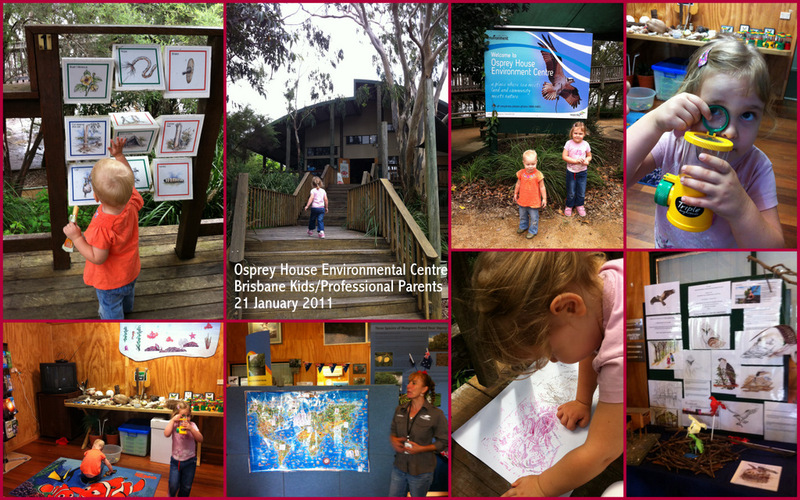 Osprey House is a fantastic environmental centre in Griffin (north of Brisbane, not far from North Lakes). This was our fourth visit, and each time we discover something new. It’s a perfect outing for families with children of all ages – and best of all, it’s free. Open to the public all week from 10am to 4pm, it’s named after the resident Ospreys who live high up on a pole in the carpark. Look out for the nest when you arrive and though you can’t get a close look, you can see videos from the “OspreyCam” on the website! Run by the lovely and very energetic Kim, the theme for the school holidays event we attended was “multicultural kids”. We celebrated the many different backgrounds of the children present, mapping out locations they and their ancestors were born around the world. This was followed by a discovery walk around the boardwalks. The children made beautiful artwork with the metal rubbing plates of aboriginal historical significance with multicoloured crayons. We had a yummy morning tea of cold watermelon while the children enjoyed exploring the displays and activities in the centre, and took another wander around the boardwalks built over the mangroves.